With my job being travel related I am often having to go away for a few nights. I used to be terrible at packing light and instead I would pack ridiculous amounts "Just in case" the 3 dreaded words everyone has said at some point! Well over the last year or so I have learnt how to pack light and only pack essentials I thought today I would share with you what I pack for a night away! So this can vary depending what the occasion is that I'm away for and also the length of time I'm going to be away but I will normally pack 1 pair of black Jeans, 1 Jumper, 1 top and 1 going out top that I can pop on if we are going out somewhere a bit fancier. 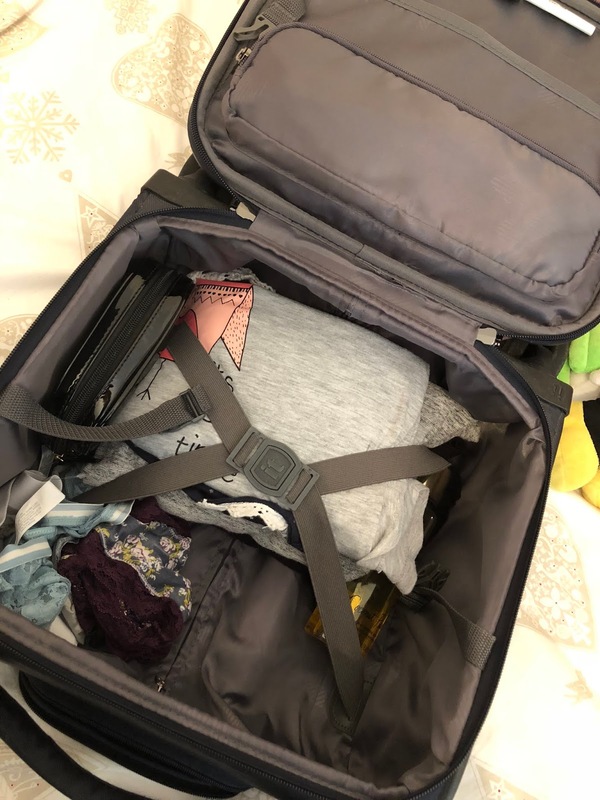 I'll also pack 1 set of Pj's and will normally opt for shorts and a T-shirt as it saves space, knickers and underwear I normally over pack by a few pairs just in case of emergency situations! Shoes again completely vary but will normally wear my trainers whilst travelling and then have a pair of small ballet shoes as they are compact to pack but also can be dressed up or down. This is where I pack the essentials such as toothpaste, toothbrush. I'll also before I travel either buy or hunt out my travel bottle sets and then place a small amount of shampoo, conditioner and body wash to keep me going for a few days. I know a lot of hotels have their own minis that they put in the room but I would much rather use my own as sometimes hotel ones can make my hair feel quite dry. Of course one of the first things to pack is my makeup bag filled with all the makeup that I use of a daily basis, I will also take my makeup remover, serum and moisturiser so that my skincare doesn't lack just because I'm away. The main bits that I pack are my hairdryer, straighteners and phone charger. I've tried hard to keep all my other bits to a minimum and not over pack or pack things that I don't need as it just takes up too much space!